Home / Information / What Happens When You Quit Smoking Now? Smoking is a very bad habit. Nicotine, carbon monoxide and other intoxicants are inhaled by a smoker when he smokes. Such stuffs are undesirable for smooth working of a human body. Such intoxicants, carbon monoxide and nicotine badly affect the lungs and may result in different types of cancers. Smoking cigarettes is very dangerous and may result in death. So it's good in never trying cigarettes and other stuffs that deals with smoke and nicotines. However, if you are already a smoker, I hope you will quit it after knowing that even after one day of quitting smoking, you will have less chances of heart attack. 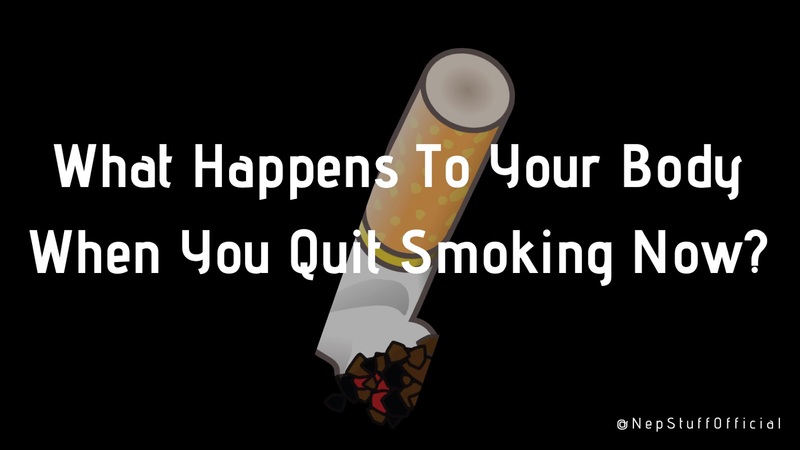 So, What Happens After You Quit Smoking? Just after 20 minutes of your last cigarette puffs, your heart beat and blood pressure tends to normalize. You feel more easy to breathe and bronchial fibres in the bronchial tube remain free which work as bacteria and other impurities remover out of the lungs. After approx. 12 hours of your last cigarette Carbon monoxide that enters your body with cigarette smoke; leaves your blood. Your blood now gets enough oxygen that helps nourish blood vessels and tissues. Within one day constriction of arteries and veins get reduced, oxygen level gets normalized, blood pressure and heart rate come to their normality. Your lungs start getting rid of smoke wastes and mucus. Hence, you have already reduced some chances of heart attack. Nicotine in cigarettes affect our nerve endings which are responsible for tasting and smelling. After 2 days of quitting smoking, such nerve ending gets nourished so you would now taste and smell more better. After 3 days of last cigarette nicotine level in body reduces. One feels more easy in breathing as bronchial tubes start to relax and you feel more energized. However some chain smokers might get moody, angry, headaches and irritated. If you came up to here, without smoking, Cheers! you have that gut to quit smoking for forever. Your lungs now start to perform 30 times more efficiently. Your body now starts healing well. You feel highly energized and shortness of breathe gets removed. You may notice positive changes in your cardio vascular activities like running. Fibers in bronchial tubes start growing well and strong, likely to reduce infection in lungs. In case of female fertility gets improved. After 9 Months - 1 year. Up to this time interval lungs get highly healed. Chances of coronary heart diseases gets reduced to half. Hair like structures in lungs, which help to remove mucus out and fight against infection now have completely recovered. You now feel magical improvement in your health. You breathe well and coughing problem gets magically sorted out. And yeah, you have saved your thousands of rupees till now. After 5 years of quitting smoking your chances of having lungs cancer decreases by half. Your viens and arteries gets widen and free. Also you now have less chances of having stroke. Your chances of getting lung cancer and bladder cancer are reduced to half. Also chances of getting pancreatic cancer, kidney cancer, throat cancer and cervical cancer are minimized. After 15 years of quitting smoking, you are now as likely as a non smoker. Your risk of having stroke and heart attack will reduce as equivalent to a non smoker. You will now not have any issues that may result due to smoking.